Manufacturer & Exporter of Digital Clocks for Office. Our product range also comprises of LED Video Display, LCD Video Wall and LED Display. 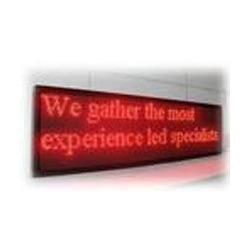 With firm commitment to quality, we are manufacturing, supplying, trading and exporting a comprehensive range of LED Moving Signs. Our range is ideal for all types of commercial establishments like hotels, restaurants, retail shops, banks, airports, clinics, hospitals and other mass traffic zones where information has to be displayed to a large number of viewers. Customers can avail these from us at most competitive rates. Looking for Digital Clocks for Office ?